WET, that’s really all there is to say about this walk. Arrived in good time at the lay by next to the AA box at Dunmail Raise. Waterproofs on straightaway. Went along according to wretched AW to the wall and ended up head high in the bracken trying to find the start of the path. Anyway it’s not by the wall, it’s actually to the south of the then dry beck. 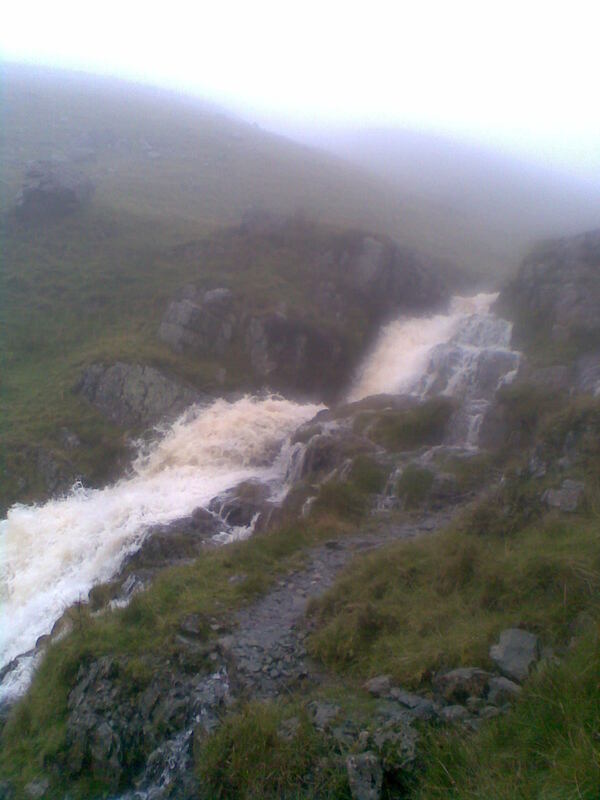 The path leads up along the beck and is pretty even in the torrential rain and there is some fun in crossing the waterfalls. The ascent was very wet but I managed to stay dry myself. At the top of the gorge, there is a crossroads marked by a rusty old iron post. I stopped here to make sure of my position. What fun trying to change the batteries on the GPS in the downpour. In a very brief lift of the cloud, I saw Grisedale Tarn ahead of me so didn’t really need the GPS anyway. Took off up to the right and quite quickly arrived at Seat Sandal. 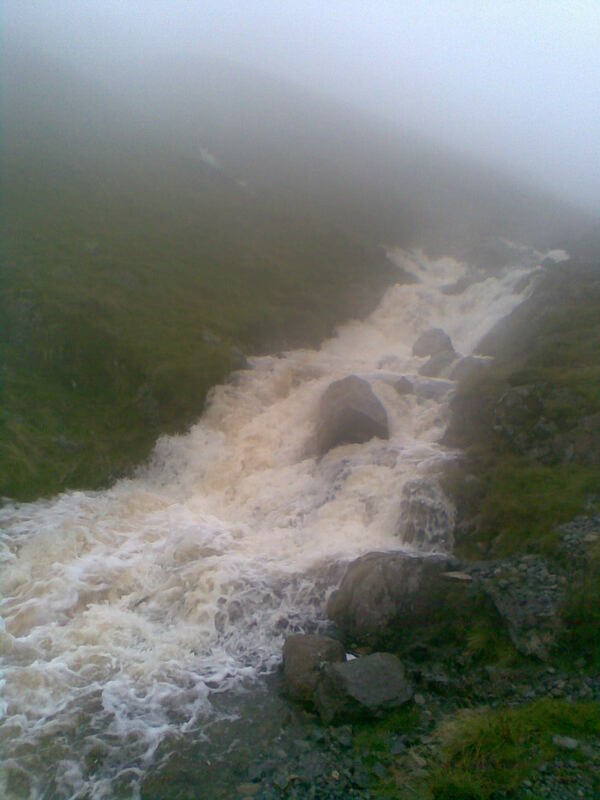 The summit was also windy in addition to the wet, so had my beef sandwich very quickly and soggily and set off back. Far too horrid to go any further. At this point started to feel very wet on top as my jacket clearly needs reproofing. Fairly whizzed back, only stopping to take the photos of the waterfalls. 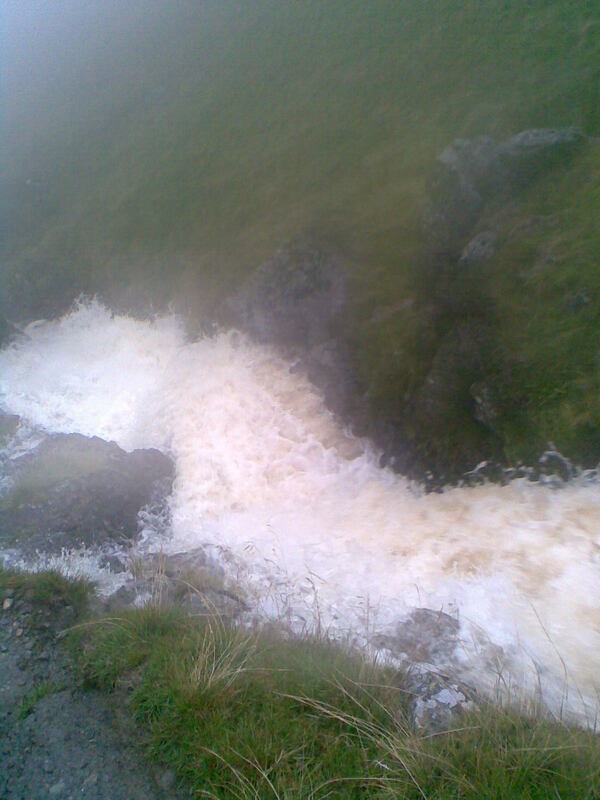 By now the fairly wet path had turned into a torrent. How glad I am that the boots are so good. Getting back I managed to find the “right” path staying south of the beck all the way. Where the beck had been dry a few hours earlier it was now filling up. Back to the car to steam it up. Pools of water in the boot. Treated myself to a pair of waterproof gloves in the cheap shop on the way home as reward for sticking it out.